“I want it all” Michelle Zauner wistfully and repeatedly cries on this album’s opening track ‘Diving Woman’. It’s a lyric that describes the tone of this whole second album, as her ambitious spirit pushes her to evolve. Zauner's subtle sensuality reminds me of Lana Del Rey’s nostalgia-laced storytelling, with a driving bassline and twinkly guitar behind it that's like some mix between LCD Soundsystem and Frankie Cosmos. The rest of the album only builds from there. Luckily for us, on Soft Sounds From Another Planet Zauner also holds onto the rough-around-the-edges heartfelt intensity from her debut, last year's Psychopomp. When I met her, as she opened for similarly heartfelt singer-songwriter Mitski in Berkeley back in spring 2016, I was struck by the honesty with which she presents herself on stage and on record. It’s a quality that is essential to my appreciation of Japanese Breakfast and many other indie-alternative artists characterised by their songwriting, and also a quality that makes me nervous with each of these artist’s new albums. All too often, of course, brilliant songwriters lose their charm and relatability as they try to grow and flesh out their discography. Michelle Zauner, though, walks the line between zealous production and slowed-down intimacy, and this record confirms my hope that she is capable of much more than one magnificent debut. Psychopomp was filled with dark lyrics about taking care of her dying mother and the emotional confusion that comes with speeding up a relationship so she could marry before her mother passed. Formerly the front woman for Little Big League, Zauner created Japanese Breakfast so she could make music on her own terms, feeling her role in LBL was too set and unchangeable for the swinging emotions she needed to get out. Continuing the solo project, presumably with the intent of maintaining personal control and flexibility, it makes sense that notes of Zauner’s debut arise through the transformed eye of someone now a few years past her mother’s death and having settled into her marriage. Perhaps her sound has matured so gracefully because Soft Sounds is the product of the same strong-headed woman who knows herself a little better now. 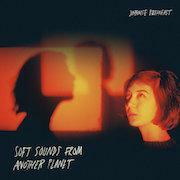 Laced with extraterrestrial atmospheric intros and outros, standalone experimental tracks like 'Planetary Ambience', and slightly tongue-in-cheek speeches like that at the top of lead single 'Machinist', the album also packs in multiple playlist-worthy tracks exemplary of a tone that is distinctively new but still echoes the old Japanese Breakfast. Though there’s likely never going to be another 'Everybody Wants to Love You' (the childishly charming breakthrough track from her debut that would most certainly get old if she were to try and repeat it), 'Road Head' has some of the same cynical pleasantries, and the album still maintains the arc from synth-y opening track to 'Soft Sounds From Another Planet' towards the middle to slow ballad at the end. There are songs that are entirely new for Zauner, too, like anxious ballad ‘Body is a Blade’ and 'Boyish', my favourite song on the album. Perhaps the best example of her evolution, 'Boyish' describes the conflict between Zauner’s adult independence and a lover’s unpredictably appealing childish behavior in a swooning, deliberate manner. Perhaps with age comes an ability to separate herself from the music a little more - not in the sense of making it less heartfelt, but just a little less literal. Though only loosely sculpted, the album has a planetary theme, only directly appearing on a few tracks through imaginative storytelling and a heavier reliance on glittery-sounding synths than we’ve seen before. It does feel much more thought-out, though, as if Zauner had more deliberate intentions for how the songs would transition between each other than collecting tunes written in heats of passion and heartbreak like on Psychopomp. The result is an album that holds your attention, smoothly mixing up tempos and degrees of sadness as it goes along. Though the album is more experimental than we might have expected, it has the most value in its layers - it pulls at the heartstrings because of its detailed, sombre storytelling but is still something that can be played casually and in pieces. With it, Michelle Zauner carves out her place as a solo artist, floating in a realm between indie, alternative, and punk in the sense that Chastity Belt or Girlpool might describe themselves as such. Complemented with self-directed, consistently alcohol-filled, funny and unnerving videos, the album showcases Zauner’s independence. Japanese Breakfast is turning into an artist with much to adore, unabashedly authentic but creating music that we can still all see a little bit of ourselves in.